If for whatever reason you are one of the very few people on this Earth who wants to go into, rather than get out of, the Gaza Strip, you may want to know what to expect. Because although it’s been just a bit less than a year since the Israeli-Gaza conflict of 2014 — or “Operation Protective Edge,” as the Israeli Defense Force called it — came to a halt, you shouldn’t expect to find a society rebuilding. No, according to “The 51 Day War: Ruin and Resistance in Gaza,” the new book from Max Blumenthal, the journalist behind 2013′s incendiary “Goliath: Life and Loathing in Greater Israel,” what you’ll see instead is mountains of rubble, barely any less than there was at the conclusion of the war. Based on his contacts in Gaza as well as his own first-hand reporting, Blumenthal’s book does two things, neither of which are especially welcome in U.S. politics and the mainstream media. Blumenthal not only provides a methodical breakdown of the run-up to the conflict — one that differs in crucial respects from the narrative most commonly found in American media — but also offers a more detailed accounting of what was happening behind the fog of war. He also tries to answer some of the still-vexing questions about the war: Why did it last so long? Why so many civilian casualties? And what was even accomplished? 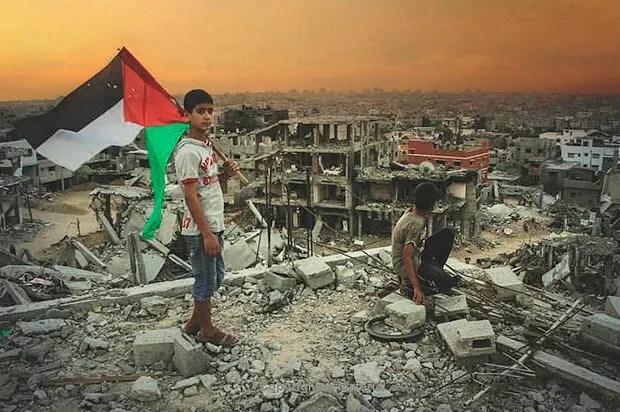 Recently, Salon spoke over the phone with Blumenthal to discuss the book, the history of Gaza many Americans don’t know, why he believes the war was an almost deliberate result of longstanding Israeli policy, and why he believes it won’t be the last. Our conversation is below and has been edited for clarity and length. You argue that last summer’s war cannot really be understood in isolation, that one has to see it in a larger context. For example, why do you think the situation today is a consequence of former Prime Minister Ariel Sharon’s “disengagement” from Gaza in 2005? The withdrawal of religious nationalist Israeli settlers (who numbered about 9,000) from the Gaza Strip was celebrated by liberals, because they saw these fanatics being forced by Israeli troops from an area that Israel [had] occupied. This actually should have been a scenario, this unilateral withdrawal, that anyone who had any concern for the people in the Gaza Strip would have opposed, because the agenda was very clear and out in the open. It was to remove [Israel] from the obligations of the Geneva Convention regarding the Gaza Strip, to claim that it was no longer occupied. What did that new footing do for Israel? It enabled it to establish a panopticon-style system, where it controls the exterior; the sky, the sea; and can place the Gaza Strip under a very high-tech siege, a robotically-controlled siege. Secondly, it allowed Israel to retrench its control of the major settlement blocks around East Jerusalem. They received a letter from George W. Bush [requesting] the unilateral withdrawal from the Gaza Strip, and guaranteeing these gigantic settlements on top of the Palestinian aquifer — which cut deep into the heart of the West Bank and will eventually separate the West Bank from itself — will remain in permanent Israeli hands under any US negotiated peace agreement. That’s point number two. Point number three is that withdrawal, in the words of then Shin Bet chief Avi Dichter, allows the military more “freedom of action” in the Gaza Strip. If there aren’t Jewish Israelis in the Gaza Strip, that allows you to start using 150-mm artillery shells during these barrages of the border regions; that allows you to use 2,000-pound fragmentation bombs. As soon as the withdrawal took place, you started seeing the use of experimental weapons, like dime weaponry. Gaza started to become a laboratory for the Israeli weapons industry, and for the entire mechanism of control that Israel’s trying to market and export to the word as field-tested. I just want to make one more point: we have to understand to what the Gaza Strip is, in the grand scheme of things — not just since 2005, but since 1948. Seventy-two to 80 percent of the Gaza Strips’ population qualify as refugees. That means that they are the descendants of people who, during “the Nakbah,” between 1947 and 1948, were forcibly expelled from what is now Israel. These people can’t be allowed to return to their homes under the Right of Return — which is guaranteed to them under UN Resolution 194 — because they’re not Jewish. If they come back, Israel’s Jewish demographic majority will be compromised. That is how the rulers of Israel, who also rule all Palestinians, see it. They see the population of the Gaza Strip as a demographic threat. So the Gaza Strip is a human warehouse for a surplus population — it’s anachronistic in the modern world. A population is being warehoused because they are of the wrong ethnicity. That’s why the Gaza Strip resists. To me, that is really the essence of the crisis. Your mentioning the demographic angle brings me to Arnon Soffer, whose colleagues nicknamed him “The Arab Counter.” Who is he? Why is he important? He anticipated that his policy recommendations would reduce Israel’s national security, all in the name of maintaining a demographic majority? He said that to the Jerusalem Post — and this is when he was a close adviser to Sharon. Sharon credited Soffer with convincing him to disengage [from the Gaza Strip]. It was printed in Israel, but not in the U.S.. I don’t endorse Soffer’s racist language or ideology, but what he said has come true. What we saw last summer with Operation Protective Edge was the fulfillment of his bloody prophecy: “kill, and kill, and kill every day.” That is what the Israeli army did for 51 days. What caused last summer’s conflict? What lit the spark and caused that 51-day war? The war was an extension of an ongoing campaign to destroy the Palestinian national movement. It’s what the Israeli sociologist Barruch Kimmerling called “politicide,” which is the destruction of an entire political identity. He’s extrapolating out of the term “genocide,” which is the destruction of an entire people. I think it’s a really accurate distillation of the long-term Israeli strategy. I don’t think that Israel has any intention of physically exterminating Palestinians by the hundreds of thousands. It simply wants to eliminate them as a national movement, and make them into wandering Arabs who are either confined to Bantustans in the West Bank; a human warehouse in the Gaza Strip; fourth class citizenship and providing menial labor in Israel proper, or just simple refugee status. But with no political leadership, and no nationalistic goal. Elias Isquith is a staff writer at Salon, focusing on politics. Follow him on Twitter at @eliasisquith.